King Billy Casino is offering an exclusive welcome bonus for GamingZion readers. Check out all the details below and redeem the freebies! This generous bonus is way better than the general one. First of all, the match is much higher. At the same time, the maximum bonus amount is $200 more as well. What’s more, the freebies are for BetSoft’s popular Viking Age slot. Customers outside of Australia and Canada also get to enjoy a similar offer. 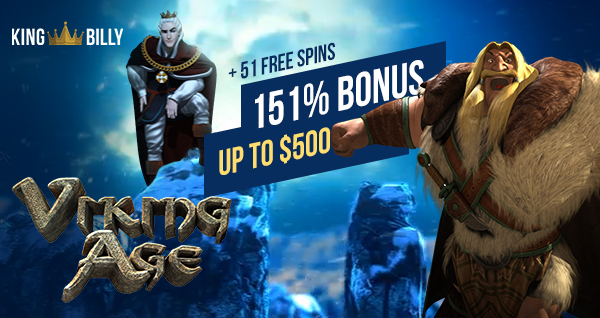 They get 151% up to €300 + 51 Bonus spins for NetEnt’s Vikings slot. If you are still not sure, make sure to read our latest review about King Billy Casino to find out more about their services, games, promotions, and support!